I am linking up with Ashley from Sweet Southern Speech to share some of my favorite gift ideas that help to develop speech and language skills. As I’m writing, I can’t help but think back to when I was buying all kinds of toys and games for my boys. It seemed that I could fill the living room without breaking the bank. We are basically down to clothing, gift cards and electronics at this point, piles that seem to be the fraction of the size and triple the cost of years past. Anyway, as fun as it was, I did have the challenge of buying for three boys. How many trucks and army guys can you have? With the youngest having a Christmas Day birthday, there was even more to buy and at times I felt like I was buying just for the sake of buying. I always welcomed the suggestion for a gift that I hadn’t quite thought of or wasn’t on the list. I found that sometimes the gift I picked up at the last minute that wasn’t on the list, sometimes turned out to be the favorite. CHILDREN’S COOKBOOKS: It doesn’t really matter which one. There are so many to choose from now. I may be a little partial to the Betty Crocker Junior Cookbook. I still have mine from when I was about 6 years old. Benefits, kids will be reading, following directions, sequencing, learning vocabulary for food and equipment. They will be learning a life skill, while they are spending time with you! They may even discover some new favorite foods. UNO: I’m sure you’ve already heard of it but it has such universal appeal. With all the different theme choices now, there’s something for everyone. It’s a game that can be played with adults and little ones. For some little ones, I modify the game by removing all of the “special” cards, such as reverse, skip and wild. It then simplifies the game to matching. This game helps with turn-taking, winning and losing, colors, numbers, some strategy, joint attention and directionality. These games are affordable and portable making them perfect for travel and keeping on hand for emergencies if you find yourself waiting somewhere unexpectedly. If you’re stuffing stockings, it’s a perfect fit! MELISSA AND DOUG STICKER PADS: These sticker books are appealing to boys and girls alike. They really get the creative juices flowing. The pictures and stickers are so fun ranging from cupcakes and donuts, to animals and habitats to vehicles and castles with princesses. These books are loaded with opportunities to develop vocabulary. These books also naturally give little ones something to comment about. I know in my speech room, they are so excited about their pictures they can’t help themselves but talk about what they are doing. If sharing the sticker pads with others, there will be opportunities for negotiation. These pads are available directly from the Melissa and Doug website but I have also seen them at various craft stores that offer significant discounts. LAST WORD: We are big gamers in my house. Not the gambling type. The board game type. We play every holiday and we are always looking for a game that both the adults and the younger ones can play. This one fits the bill! This game is perfect for categorizing. The object is to name as many items in a category as possible at the same time, starting with specific letter. No repeats allowed. The last one to call a legitimate answer before the timer goes off gets to move ahead on the board game. We have modified to remove the letter requirement for younger players. I’m not going to lie, this game has come out at night with just the adults and can take on a no-kids allowed in the room version. For about $20 you can find this game at most stores carrying games (e.g. Target and Walmart). If you are working on winning and losing, negotiating and being flexible, or your children are working on those things, this is a must have game. ORCHARD TOY GAMES: I have recently discovered Orchard Toys. These bright and engaging games appear to be simple, but can offer a bit more complexity for older ones (7-8 year olds). If you don’t want your child to play a game with a burping gorilla, then you should avoid the Greedy Gorilla. All of these games develop some type of skill which is outlined on their Orchard Toy Website. Many games target vocabulary, memory, turn-taking, using strategy, winning and losing and joint attention. I have ordered my games on Amazon and have been able to get most for around $12-$15. PHOTO BOOK OR CALENDAR: It may be too late for this year but could be something to think about for next year. My students LOVE when I take their pictures. They love when I send them home to parents and they especially love when they see themselves and their friends on the monitor in the front of the school. I think a book or calendar chronicling the year of the child would be so exciting to open. So many opportunities to talk about past experiences. When looking at these books with others they will be asked “where were you?”, “who did you go with?”, “what did you do there?”, questions many of our kiddos are working on. I have made photo books through snapfish and have found them very easy to use. I’m sure there are other sites that provide the same service. I am just posting the one I have had experience with. I have made books for vacations but wish I had done this for my kids when they were small. A gift, a keepsake and a language developer. Win. Win. Win. My last suggestion is not actually a gift but an activity. Even though this can be a crazy and hectic time of the year, it really is a nice time to go through the old stuff (toys, books, games) and decide what is worth keeping, what is worth throwing away and what is worth finding a new home.I know that it’s easier to do it without the kiddos but it does provide a good opportunity for some early developing executive functioning skills. Most little ones won’t be able to do this alone, but once we provide a framework and a system to use, they often find it easier to complete the task. Providing a physical space, whether it be a bin, box or a sheet labeled for each group, will help to provide visual support for the sorting. You may also have an “I don’t know” area as well. Doing this, we are providing kids the opportunity to explain why they might want to keep something or get rid of something that we think may have been costly and hasn’t been used enough. If you are wondering what to do with toys, books or games that need a new home, find a school based therapist or preschool. We hardly ever say no to those gently used items. We all have different traditions and feelings on gift giving. What ever your philosophy may be, most of us are still buying gifts for younger ones, whether they be sons, daughters, nieces, nephews, grandchildren or an “adopt a family” child. If you are purchasing for a young one, you may want to consider one of my suggestions for gifts that promote speech and language. For other suggestions, link back to Sweet Southern Speech to see what other therapists are recommending. The students love reading this fun book about 10 ghosts who are scared out of their own house. This book can be used to target vocabulary, rhyming and /g/. I use 10 ghosts on a flannel board that the students take turns removing while we read the story. Always a hit. We will be reading some spooky jokes and riddles from this book during our Joke Club. More on our Joke Club coming very soon. This Old Lady will have us moving as we pair movements to the repetitive text. This book will help us to meet targets for concepts, vocabulary, predicting and sequencing. Of course we will be reading about this old lady too! The students never seem to grow tired of feeding the old lady all kids of crazy items. We will be developing concepts, vocabulary and sequencing when we read this book. We will also be hitting some of our language targets using these fun Halloween themed activities from Teaching Talking. 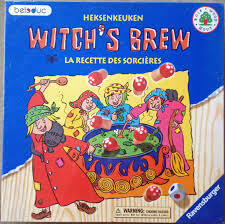 We will be using a favorite game Witches Brew. This game is simple enough, be the first one to find and match eight correctly colored mushrooms, yet it appeals to most all students, regardless of ability. I use this as reinforcement during articulation practice, for turn-taking, accepting disappointment when losing and expanding the repertoire for leisure activities. I don’t think the students like when I try to keep this game reserved only for October. Some might perceive that as a lack of flexibility, I like to think of it as organization. There are many students working on articulation this year so I am trying to keep all of our work organized in speech notebooks. We are using some activities from Teaching Talking Articulation Notebooks, as well as other worksheets for drill practice. I am also keeping returned homework in the notebooks to keep track of what was given and what has been returned. Students still have folders that go between home and school but the speech notebooks stay with me. They will go home at the end of the year. I am planning on doing one post each month, spotlighting one book and its related activities so that parents can have a better, more detailed look at how these books and materials are being used during speech. That should be coming in the next few weeks so keep an eye out for that! May is looking like it is going to be a busy month! To start with, it is Better Hearing and Speech Month (BHSM). To do my part in helping raise awareness about communication disorders and how they can be treated, I am going to challenge myself to participate in the Instagram Photo-a-Day challenge hosted by Jessica over at Consonantly Speaking. I will TRY to post a different picture each day in May. Each day has a different theme. I’m a little worried about day 3 – decoration, not exactly my forte. You can find out more about the challenge here. You can follow me with my Instagram link on this website. We’ll see how I make out! Should be interesting! These bright and engaging books are loaded with descriptive vocabulary and always get the students talking! We will be doing some related activities, games and crafts. We will also be using the Spring Language and Activity Pack by Kathryn from Teaching Talking on TpT. The students love using the interactive manipulative pieces. This is already prepped and ready to go! Students who are working on articulation and fluency have been enjoying coloring open target drill sheets like this one. We will be using more of these available for free on TpT. 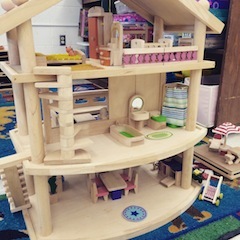 Our lunch groups have been enjoying playing with this beautiful, wooden doll house that was donated to the speech/OT treatment space by a generous parent from the school. True confessions, Kat (the OT) and I MIGHT have had some fun playing, I mean setting it up for the students. Our second grade class meetings will continue to play What’s Yours Like, created by yours truly, which is a spin on the popular, family board game. The students have been getting the hang of this fun game that the whole class or a small group can play. I hope the students don’t have Granny withdrawal this month! This might be the first month we don’t read “An Old Lady Who” book. I think they’ll all be fine with the other fun things happening in the speech room! A Nice Surprise and a Lovely Blog Award! Thank you to my blogging buddy Heidi for nominating me for this One Lovely Blog Award!! Check out her blog that is loaded with ideas for therapy, especially for children with social language challenges. You can find her blog Smartmouth here. 1. I am mom to three teenaged boys who keep me busy on the sidelines of their sporting events and in the kitchen, keeping them fed! 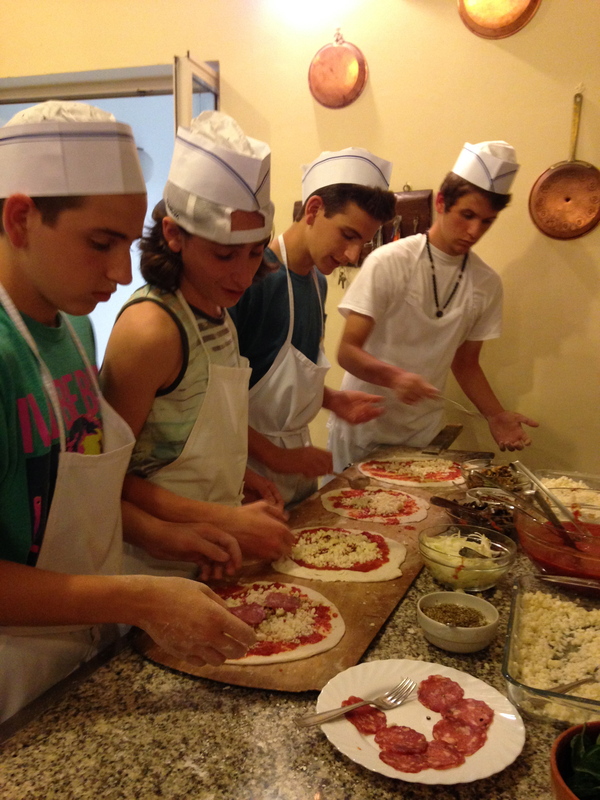 Here they are (plus a nephew) having fun making some pizzas in Sorrento, Italy last summer. 2. 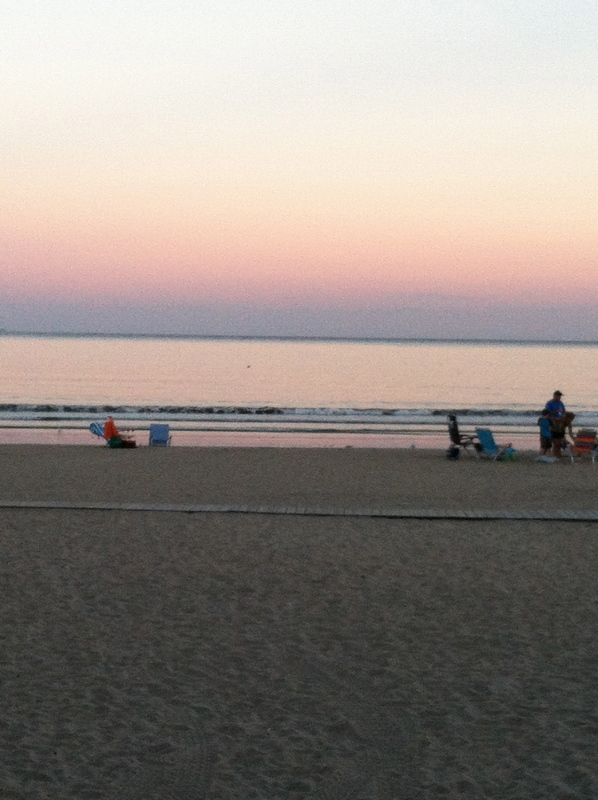 I love the beach! I’m lucky enough to live miles away from the water and only 30 minutes away from some of my favorite Rhode Island beaches. My favorite time of day to be there is 5-8pm. 3. I love to cook. I have been watching cooking shows since I was a child. At that time, Julia Child was the only option but I didn’t mind. 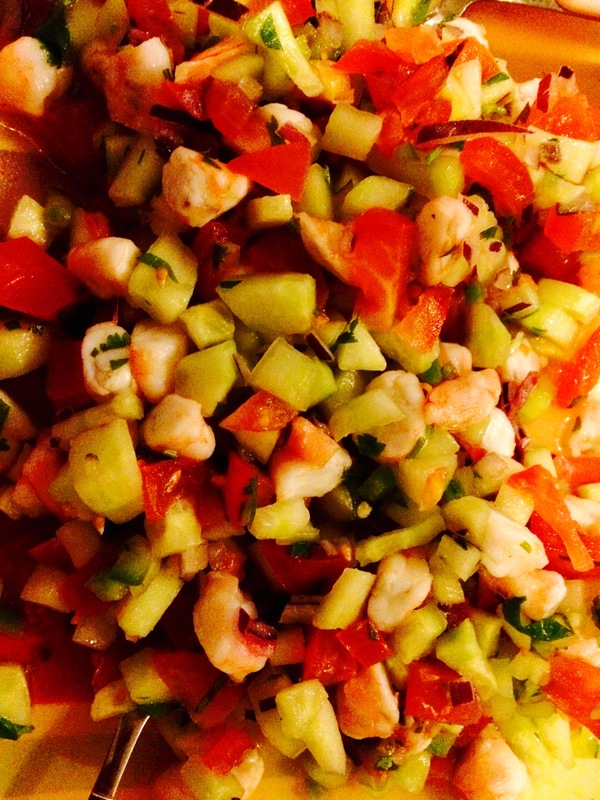 This is one of my latest creations, shrimp ceviche which will definitely be a staple this summer! 4. Usually if one loves to cook, eating is also a love. I try to eat clean and love trying new things. 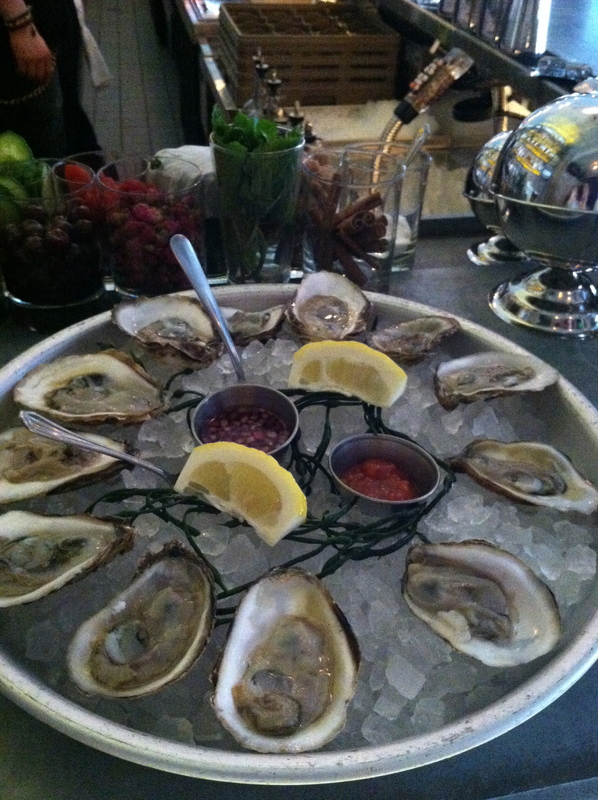 Seafood is always a safe option for knowing what you’re getting when dining out. Of course, I nice glass of wine paired with this would be perfect! 5. I’m a bookworm. I always have a book or my kindle with me. There are so many benefits of the kindle but I still love to hold a book or have one around. I’m addicted to Goodreads and love talking about books with the members of my online book clubs. If you are interested to check out what I’m reading, have read and plan on reading you can go to my Goodreads account here. 6. I love games; I love almost all games. I love old fashioned board games, word games on my phone, card games, trivia and so on. I will try any game just about once. Most holidays are spent playing some type of game or two. We are all a bit competitive so it makes for some interesting times! 7. I have become a fitness band addict! I have a fitbit and a misfit shine. I love the ease of knowing my steps with the fitbit but I don’t like that it has to be charged. I love that the misfit shine is waterproof and stylish, but don’t like that it is extremely temperamental when it comes to syncing. Today, I noticed that I’ve misplaced the charger for my fitbit so I’m having one sent overnight because I hate the thought of being without it! I noticed Heidi and I have similar tastes in bloggers, so please refer to her sight to see some of my favorite bloggers who she’s already recommended. Here are some other bloggers who I think are worthy of a recommendation! Since this is all new to me and I don’t want any duplicates, I may be a little shy of 15 nominations. 1. Beautiful Speech– Kristin is a teacher, SLP Assistant and working on getting her Master’s in Speech Pathology. Check out her site for great ideas and app reviews. 2. The Modern SLP – Christy is a stylish SLP with great ideas! I especially love her blog about tiny pieces. 3. Reading Books with Ellie Ellie, a fellow Goodreads friend is working on her doctorate, getting back into the classroom with two little ones at home. I don’t know how she finds the time! Check out her site for her latest book reviews. 4. Speech to the Core – I love how Lindsey has guest bloggers posting about what a day is like in their speech room! 5. Middle School Speech and Language– Gabriella has lots of great information for those older students who can sometimes be a challenge (for me anyway). 6. The Speech Owl– Lots of energy and ideas coming from Elizabeth at the Speech Owl. 7. TLC Talk Shop– Another spot to with lots of useful therapy ideas from Tami. 8. Yo Amo Speech – Noralyssia, who is a bilingual speech therapy assistant has a cute page set up with great ideas. 9. My Speech Party – Keri has lots of great information targeted for children. 10. Smartmouth– I am so fortunate that I have met Heidi on this blogging journey. We have some similarities in our backgrounds (mom to boys, years worked) and she has been a strong supporter of mine since I started. I’m truly grateful for that. Thank you Heidi. Now it’s your turn to go and make someone’s day, like Heidi made mine! Go and nominate a fantastic blogger! Recently, during a class meeting with second grade students, we introduced a spin-off game of What’s Yours Like?. We played a child friendly version available here on TpT (shameless plug). We played with a second grade class, who was able to play successfully but I wouldn’t recommend playing with students any younger. During the game, there is a “Guess Word” which can be anything from a backpack, to a bike to hair. One student asks the others students “what’s yours like?” in an effort to try to guess the “Guess Word”. Students are to answer truthfully but cleverly. The object of the game is to try to guess the “Guess Word” with the fewest clues possible. For example, if the “Guess Word” was closet, students might describe their closet as “messy”, “cluttered”, “organized”, “empty”, etc. If one were to answer “where I hang my clothes”, the clue would be too obvious and the guesser would be able to easily guess the guess word. The game seems simple enough, but it was definitely a shift for some of the students. Students were used to giving clues so others could make a guess, not offer clues so others wouldn’t be able to guess. You might think it would be the children with the language difficulties who had the most trouble with this game, but not so. It really was the children with social language challenges. We had been playing several games such as reverse charades and spring taboo (shameless plug number 2), where the students were to give clues so that others could make a guess as to what they were describing. This game requires students give truthful clues while hoping the guesser doesn’t guess correctly. Students with social language difficulties had a hard time demonstrating this flexibility in thinking. To give an example, one of the target words was shoes. Several of the students described theirs as “worn out”, “broken”, “glittery”, etc. One very bright boy, with social language challenges, described his as “white on the bottom”. He then sat with his feet sticking out (children were in a circle on the carpet) towards the guesser waving his feet at her, hoping that he would provide the clue that elicited the correct answer. Why is this important? This is important for several reasons. One for those students, who are perceived as bright and achieving well academically, performing in such a manner during this game can look like behavior. It may look a little like a student trying to be the class clown, when in fact, he/she doesn’t understand the game expectations. Two, the other students can become frustrated. As a whole, the class doesn’t want the “guesser” to guess the “guess word” so when it appears that someone is trying to give it away or deliberately provide a clue, the others in the group become annoyed with that student. This can result in the student who is giving the deliberate clue to be hurt and confused. So, what can you do? 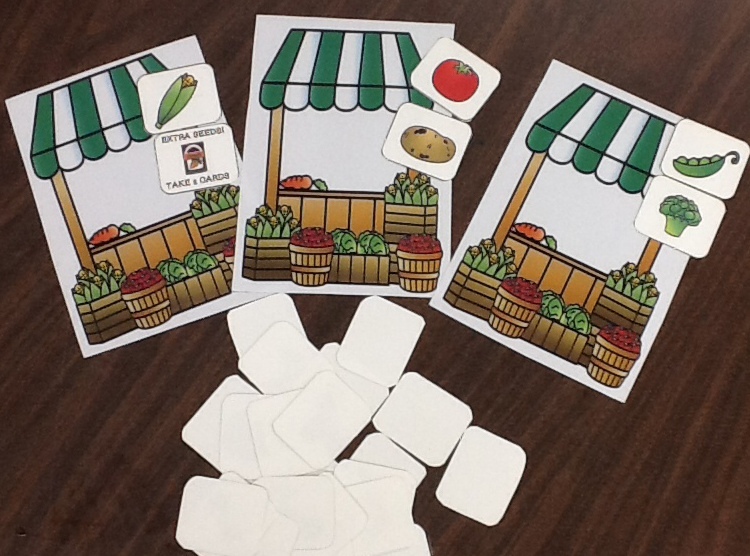 For those students who have social language difficulties and may have trouble understanding the concept of giving clues but not wanting someone to guess correctly, you can pre-teach the game and practice in a smaller group setting, time permitting. You may also want to provide a sheet of descriptive words for students to use (included in my What’s Yours Like? game -shameless plug number 3) to help students make accurate yet not obvious descriptions. So much emphasis is placed on academics and number of instructional minutes in the classroom these days. There seems to be less and less time to “play games” and “have fun” when in fact these types of games (Taboo and What’s Yours LIke? – last shameless plug) promote problem solving, inferencing, descriptive language, social language, team building and a sense of class community. I think it is important to try and build time into the day, even if only for a few minutes per week to target some of these important skills. Recently, more and more parents have asked me about the apps I recommend for home. While I use apps with students and find many of them helpful, I don’t really recommend them for home. I have let parents know the apps I have found to be successful, but in general, my recommendations for carryover of speech, language and communication skills are not apps. What do I recommend for home carryover? Games, games and more games. Games target so many of the skills our children are working on: following directions, giving information, providing explanations, concept development, social interactions, turn taking, problem solving, opportunities for articulation carryover and the list goes on…Depending on the game, math skills and reading fluency could also be targeted. It’s also good quality time for the family. We have many game nights in my family. Ages range from my youngest niece, who is 9 to my mother who probably doesn’t appreciate her age being revealed. We also bring a new board game to almost every holiday. In the summer time we have “game nights” by my brother’s pool. The teenaged boys actually request these nights with the family. Here is a great list of games by the artful parent. I also strongly recommend cranium games. Some favorites in my family also include Last Word which can be scaffolded for different playing levels, Catch Phrase and What’s Yours Like? There are so many games that are great for carryover practice, it would be impossible to list them all. You probably have some in your closet right now. Go take a look. I know not everyone loves to sit and play board games, but not all games need to be sedentary. This Easter we launched our first Easter Games (I took first in yo-yo and jump rope, thank you very much). The games we played required establishing teams, negotiating events, keeping score and demonstrating sportsmanship (more on that later). We only had one episode of tears. You can find a list of some old fashioned games for outdoors here. It should finally be nice out this weekend so get out there and play! Now, a little about sportsmanship. I think (my opinion), that children should participate in games to learn how to win and lose gracefully. In this day and age when everyone “earns” a trophy for participating, it seems that children have a harder time losing. I don’t have any data on hand to back that up, but if I start to track it I’m sure I could. Many children ask me if a game is a winning game or losing game, because they don’t want to play a game that they might lose. While I understand that, being a little competitive myself, I think it’s important for children to learn how to lose. How is that related to speech and language? Social communication. We have observed many a student have a very difficult time losing, to the point that they require adult assistance to pull themselves back together. This does not put one in the best light with peers, socially. The same holds true for the student who is not the most gracious winner. No one loves a ‘sore winner”. In the speech room, you are only allowed to announce “I won!” two times and the winner usually gets to clean up, all in good fun. I’m not suggesting that games are the only way to carryover speech, language and communication but I do find them to be a powerful and motivating context to practice some of the skills we are targeting. Try setting some time aside this weekend for some family game time if you aren’t already. I think you’ll be glad you did. I’ve been wanting to share some of the daily happenings that occur in the speech room. I love that fellow blogger ChelseaSLP posts her weekly lesson plans. I thought I might try to post a general preview at the beginning of each month. These are general ideas and not all children will participate in each. 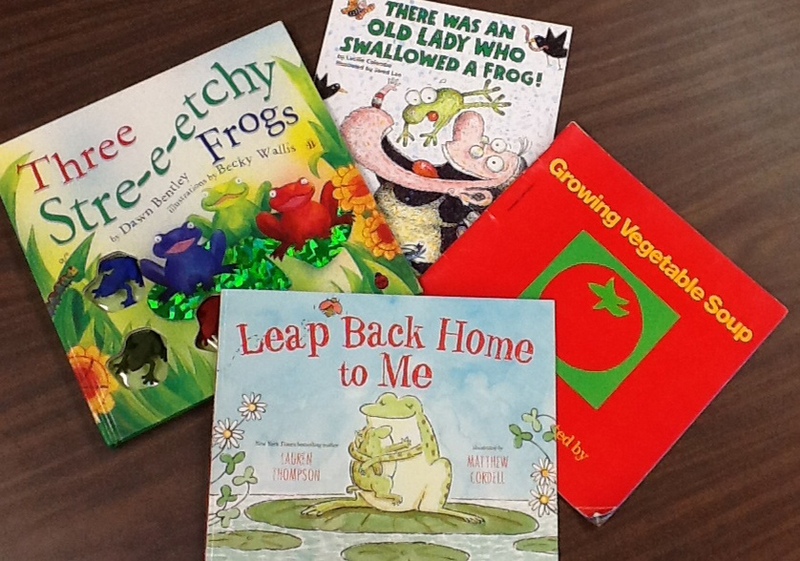 WHAT WE ARE READING: There Was an Old Lady Who Swallowed a Frog, Leap Back Home to Me, Growing Vegetable Soup and Three Stretchy Frogs. Language therapy in my speech room is almost always literacy based. I would like to devote more time to that in another post so I will leave it at that for now. WHAT WE ARE PLAYING: We are using lots of games during articulation sessions. Let’s face it, drill work can be a little dry ( I might liken it to learning to conjugate verbs when first learning a foreign language). This is where we use a little trickery. 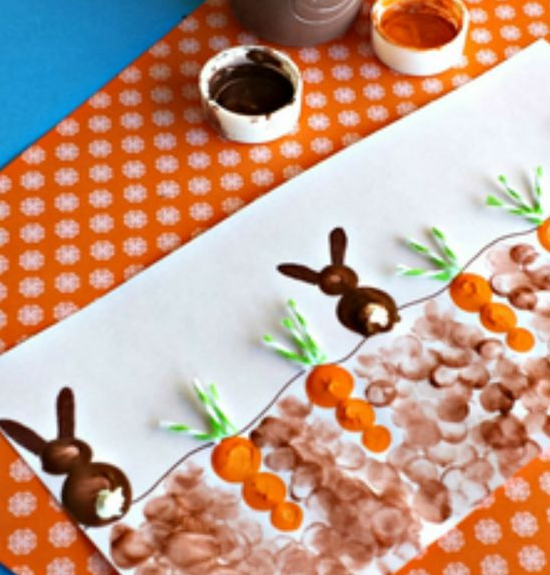 We mask the dryness of drills with fun games, crafts and activities. This month we are playing Fill the Farm Stand Game. We are also using Roll and Cover Game boards found here on TpT. Students also like using the spring themed boards for Seasonal Chipper Chat. During class meetings in some first and second grade classes we have been playing a Spring Themed Taboo Game. Why are we playing? It targets describing, explaining, listening, drawing conclusions and participating in social interactions. Oh, and it’s fun. We are hoping to play a What’s Yours Like Game, in an adapted, child friendly version. This is still in the works. To target some structural goals we are using Pronouns and Prepositions for Spring. The students love acquiring new seasonally related items for their boards and describing what they have. Many of the students can identify spatial concepts and follow directions involving them, but when asked to describe a location the response is often “it’s right here”. Not in my speech room! We will also be using spring themed barrier games (still in development). I am a huge fan of barrier games and I will probably devote a post specifically to that at another time. Why are we doing crafts? 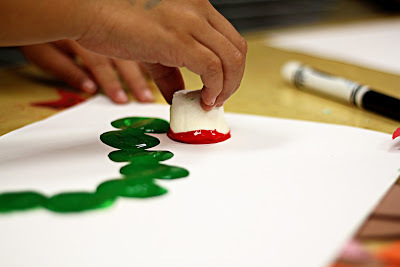 Crafts provide a fun and meaningful context to target sequencing, following directions, concepts, vocabulary, and it’s just fun to do. 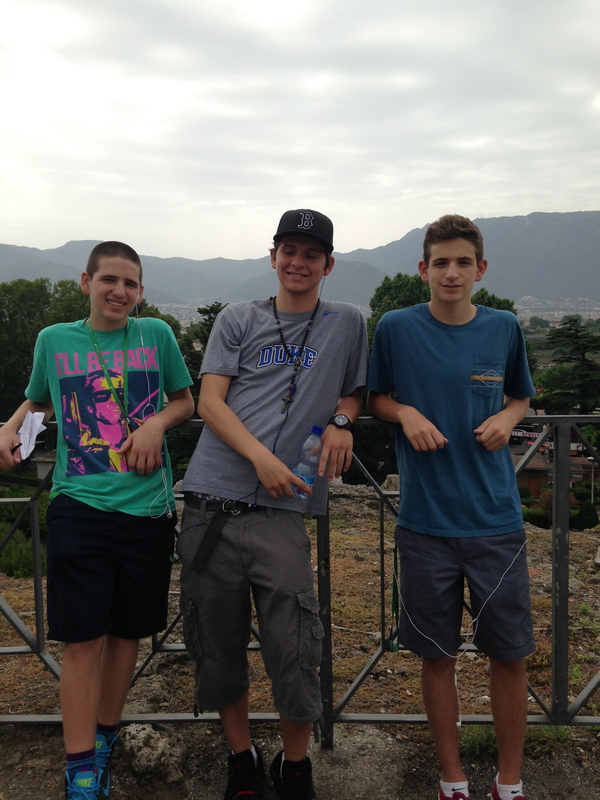 It also provides students with a hands on experience that can be talked about at a later time (relaying past events). Hopefully, we will get a chance to re-pot some of our plants. Why are we doing this? Three reasons. One, the re-potting provides the same opportunities as when doing a craft. Two, we use the plants as a daily “job” for some students. Three, they’re not going to make it much longer if they’re not re-potted. Can’t have a watering job with no plants. JUST FOR FUN: The second grade boys who come for articulation therapy have really been into sticker charts. I decided to try to make my own and take their requests. I’ve only done a few and they’re nothing fancy but the kids don’t seem to mind. Help yourself here. Spring vacation is the week of April 19th. Every year we think it will be the last year with a break in February and a break in April. Best to enjoy, in case it’s our last April break. Hopefully these are just some of the activities we get to this month.